provides translations in more than 75 languages and 2500 languages pairs for medium to large businesses. It specializes in business translations in a variety of fields including legal, technical and web applications. WPML Translation Management – this plugin will allow you to connect to OneHourTranslation. If you do not have a wpml.org account yet, you will need to buy WPML. If you do not have a registered OneHourTranslation account yet, you can very easily create one. Click on the “Register” button located at the top right area of the site. Then, you simply fill in and submit the form you see on the register page. Once the account is ready, let’s get those API keys. First, make sure you have logged into your OneHourTranslation account. Once logged in you will see the “Control Panel” menu item in the navigation. Click on it. You will then be redirected to your account’s Control Panel. Once there, click on your username to go to your Profile page. You will be redirected to your OneHourTranslation Profile page with a vertical navigation menu. Locate the API Keys menu item and click on it. Once there, copy your OneHourTranslation Secret Key and Public Key. 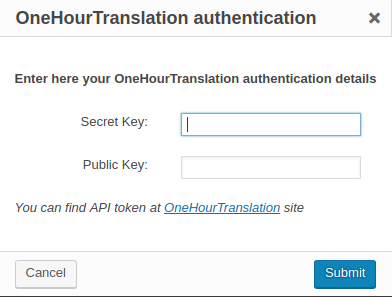 Now that you have copied both your Secret and Public API keys, we are ready to activate and authenticate OneHourTranslation from your WordPress admin. Login to your WordPress website, visit the WPML -> Translation Management administration page and switch to the Translation Services tab. Search for OneHourTranslation under Available Translation Services and click to activate the service. Once the service is active, click the authenticate button to authenticate the service. This is where you will need your Secret and Public API keys obtained in the previous steps. A pop-up window will appear in which you can enter your OneHourTranslation Secret Key and Public Key. Enter the values and click the Submit button. Congratulations! Your OneHourTranslation account is now connected to your WordPress instance. Now, you are ready to send content for translation. Please, check your word count for the submitting content using the WPML plugin. Use the OnHourTranslation’s word-count wizard to get a price quote for your content. Finally, you can load your OHT account with a proper amount of credits. 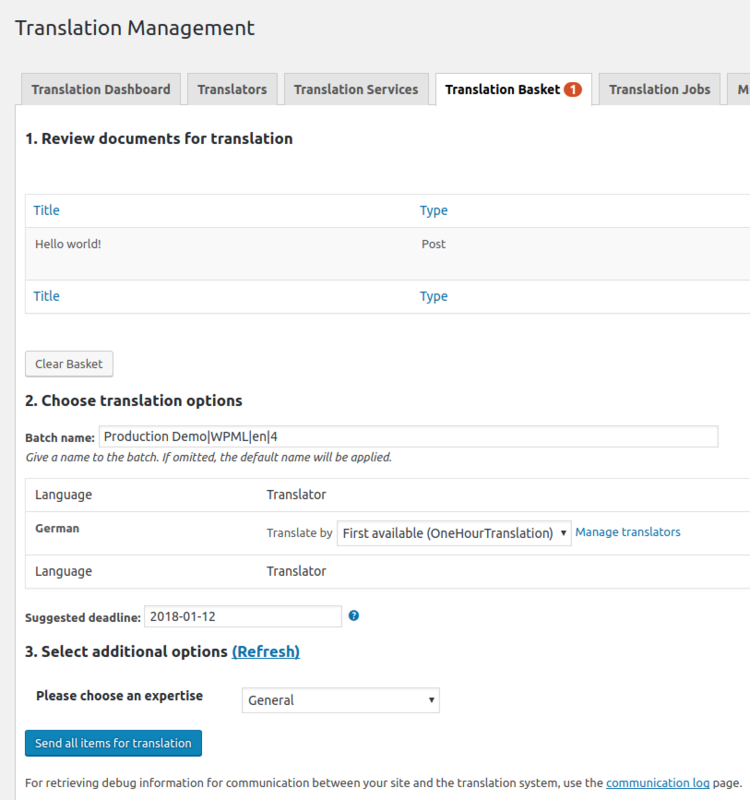 You can select the documents you want to send for translation from your Translation Management Dashboard. Select what you would like to have translated, the languages to translate to, and click on Add selected content to translation basket at the bottom of the Dashboard page. For additional information please see Sending Documents to Professional Translation. 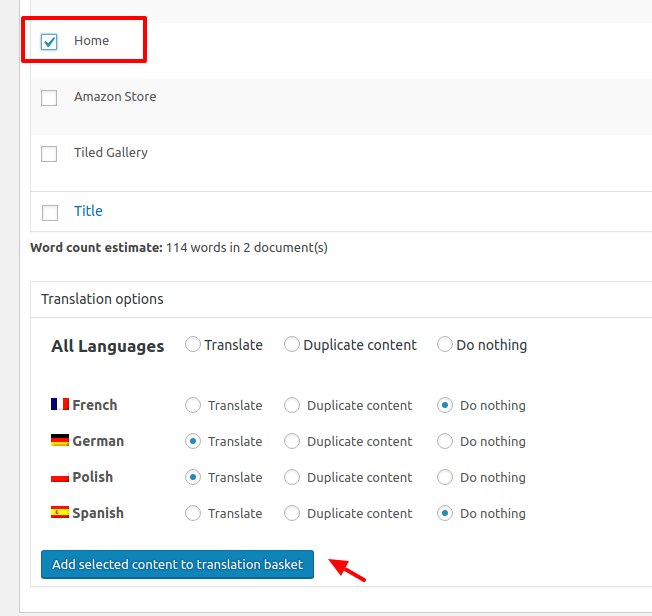 After this, the selected content can be sent to OneHourTranslation from the Translation Basket tab. If you are using the WPML String Translation add-on plugin you can also send theme and plugin texts to be translated. When the translation basket’s contents have been successfully sent to OneHourTranslation you will see a confirmation message such as that shown below. At this point, no further action is required from you. Qualified OneHourTranslation translators with the matching language pair skills will be notified of the new translation projects. Subsequently, translators will start translating as soon as they accept a translation project. You can follow the translation progress of the documents you sent to OneHourTranslation from your Translation jobs tab. If you prefer, you may also follow the translation progress of the documents you sent from inside your OneHourTranslation Project dashboard. Please note that OneHourTranslation groups the documents you sent in a Translation Batch by language. As soon as a translation job is ready in OneHourTranslation it is also ready to be delivered to your website. To check your configuration settings, open WPML -> Translation Management and switch to the Multilingual Content Setup tab. Find the Translation Pickup mode section and check the selected option. The option The site will fetch translations manually means that completed translations can be downloaded from theWPML -> Translation Management page, using the Check status and get translations button at the top of the page. You can cancel a translation project from your OneHourTranslation Project page. Please remember that you can only cancel projects that are not in progress. When a project is canceled, WPML will also cancel and remove it from the Translation Jobs list. Depending on your Translation pickup mode configuration, this will happen after OneHourTranslation notifies your website via a callback or after you have manually checked for completed translations. What should I do when a translation is ready on OneHourTranslation but is still In Progress in WPML? Sometimes the callback from OneHourTranslation might not reach the Translation Proxy. In that case, the status of the jobs is not changed. To fetch the status manually, please go to the WPML -> Translation Management page and click the Translation Jobs tab. You will see the list of all batches that were sent for translation. Locate the batch that contains your translated job and click the Synchronize status button. This button is located below the batch name. After that, please wait a few minutes before going to WPML -> Translation Management and clicking the Get completed translations button.